Food Truck Mondays Roll into Legacy Village. Popular event returns for fifth year this summer. 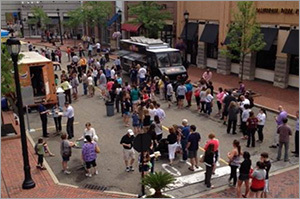 The popular 'Food Truck Mondays' returns to Legacy Village on May 21st 2018 from 11:30 AM to 1:30 PM featuring its largest lineup of Cleveland's favorite food trucks that satisfy virtually any craving. 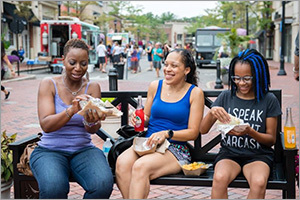 Food trucks will be setup on Main Street throughout the summer series, with a rotating schedule of food trucks returning every other week through August. Local bands will amp up the lunch hour for an atmosphere sure to chase away the Monday blues. 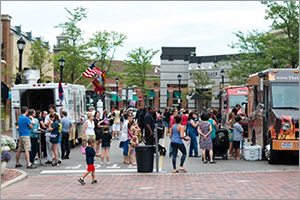 "Cleveland is a foodie town with a great love of food trucks," said Legacy Village General Manager Susan Windle. "We're proud that Food Truck Mondays has grown to be one of the largest food truck series in Northeast Ohio over the past five years. It's a great way to start off the work week by enjoying great food, live music and the summer sun." Food Truck Mondays kicks off on May 21st 2018 with many crowd favorites including 216 Bistro, Barrio Tacos, Chef Grey Wolf, Donut Lab, Jackpot Chicken Food Truck, SuperHero Food Truck, The Orange Trük and The Proper Pig Smokehouse.